**For hundreds of ways to bookmark our site. 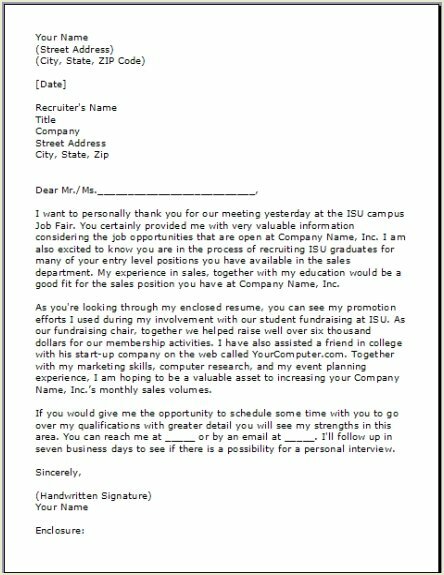 Why send a sample thank you letter for a job fair? You will meet many representatives of different companies, so this is your best opportunity to thank them for speaking with you, but more importantly to remind them of the skills and qualifications you have. 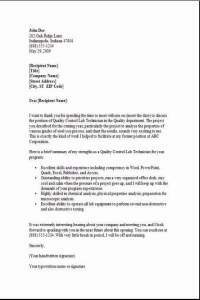 The letter encourages them to have another look at your resume that you will also include. While thanking the person also include several reasons why you're the best candidate for their position. Show your specific qualifications discussed at the job fair match the job description for their position. Show your excitement and enthusiasm about the position. Try keeping your thank you letter to one page. 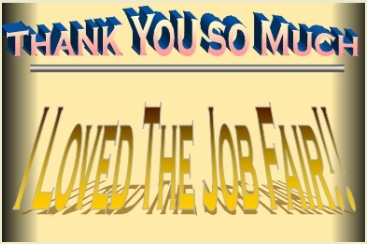 The job Fair is where you impress the people who interviewed you, the thank you letter recaps the meeting in an enthusiastic way getting them to once again, look at your resume. You would be surprised at the number of people who do not follow up after the job fair. These professionals spend a lot of time and effort to put this together and will truly appreciate and possibly be surprised to get your thank you letter. Your own Thank you letter should resemble the one we have below. 1. Easy to edit in word where you can modify it to make it your own!! 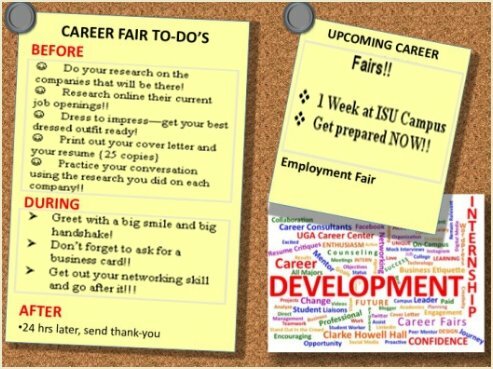 I want to personally thank you for our meeting yesterday at the ISU campus Job Fair. You certainly provided me with very valuable information considering your job opportunities that are open insert here Company Name. I am also excited to know you are in the process of recruiting ISU graduates for many of your entry level employment opportunities you have available in the sales department. My experience in sales, together with my education would be a good fit for the sales position you have at insert their Company Name. As you're looking through my enclosed resume, you can see my promotion efforts I used during my involvement in our student fundraising at ISU. Together with my marketing skills, my computer research skills, and my event planning experience, I am hoping to be a valuable asset to increasing your insert Companies Name, monthly sales volumes. If you would give me the opportunity to schedule some time with you to go over my qualifications with greater detail you will see my strengths in this area. You can reach me at _____ or by an email at _____. I'll follow up in seven business days to see if there is a possibility for a personal interview. Check the website ahead of time to see what employers will be there. Do research on the companies you are interested in. Write down any questions ahead of time so you will have them when you need them. Again check their website information. Tennis shoes and jeans are sometimes not very appropriate. • A nice looking folder for your paperwork you have prepared. • Quite a few copies of a new resume printed on nice resume quality paper. • Good list of questions showing you have done research on each company in attendance! • A refilled pen and some paper for notes. The names and contact of persons you meet.